The Egg – It IS Pretty Incredible. And Definitely Edible. Happy Thursday, folks! We’ve been enjoying lots of eggs lately. Since it’s spring, eggs seem to be everywhere. Not only are they enjoyed during Easter and Passover, they’re also symbolic of the circle of life, rebirth and continuity. But before we get too philosophical, let’s get into our post about eggs. Eggs – an easy-to-prepare, nutrient-rich dietary staple for around 70 calories. Not to mention an economically friendly addition to any meal. Worried about the yolk? Yes, the yolk does contain cholesterol, but also provides Vitamin A, Vitamin D, phosphorus, folate and calcium. Besides, if you’re concerned about cholesterol, it’s the saturated fat in foods that should be on your radar screen. And eggs are low in total fat and saturated fat. Check out the Egg Nutrition Center for more information about including eggs in your diet. Today, we answer the age-old question: How do I hard cook an egg without getting that greenish ring around the yolk? – Place a few whole eggs into a 2-quart saucepan. Fill with lukewarm water until the eggs are just covered. – Put the pot on the burner on high heat, and heat uncovered until the water reaches a rolling boil. – Remove pot from heat, turn off burner and place the lid on the pot. Set a timer to 15 minutes and let eggs cook in the water. – Prepare a bowl of cold water, and submerge eggs after the 15-minute timer sounds. Place the bowl of cold water and eggs into the refrigerator to chill the eggs. – Once eggs are cooled, peel and enjoy! Hard cooked eggs are very portable to eat as is, or with a dash of salt and pepper. Dip slices in ketchup or mayo, slice on top of greens, fork mash into egg salad, or whip up deviled eggs. 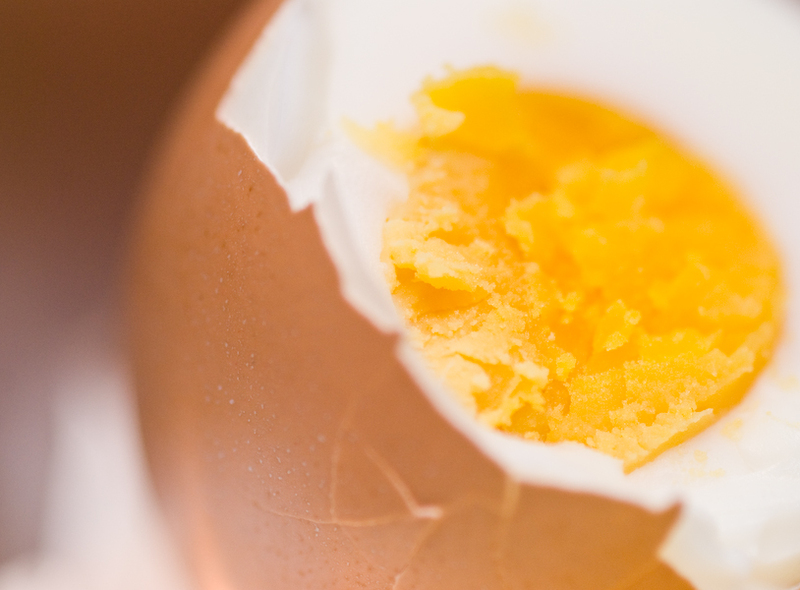 Hard cooked eggs can be stored in shell for up to one week in the fridge. For more recipes and info all about eggs, check out The American Egg Board website. Feedback and ideas are welcomed at everyfoodfits AT gmail DOT com. Happy Eating! Hi Stacey, great post! This is the same method I use to hard boil eggs too. What I’d love to know though… is… how to remove the shell consistently so I don’t make a dog’s breakfast of it? Supposedly, the fresher the eggs, the more likely the membrane is to stick, but I’ve had this problem with eggs that have been sitting in my fridge a week. Yeah, how do we avoid getting the membrane all sticky and making a mess while removing the shell. Rebecca – great question! I have inquired with The Egg Lady, aka my friend at the Egg Nutrition Center and asked her to reply on the blog. I asked her about this in the past, but don’t recall her solution to this ‘sticky’ issue. The good news is that even though you have had your eggs in the refrigerator for a week, your eggs appear to have maintained their freshness! The bad news is that due to their freshness the membrane that holds the shell attached to the egg hasn’t deteriorated so it’s a mess to peel when hard cooked. One way to make it easier to peel fresh eggs is to give the newly cooked eggs a shock with an ice bath which will make that strong membrane shrink back and give up it’s hold on the egg. And by the way, the green ring one finds when they cook the egg too long or on too high heat is only a little iron in the yolk getting oxidized, no cause for alarm. In fact, beauty is in the eye of the beholder! But there’s no disputing that Stacey’s photography is gorgeous! Thanks, Marcia, for this great information and for your kind compliments! That’s the most beautiful photo of an egg I’ve ever seen! everyfoodfits.com » Pressed for Time? Moms Know Best: Tips for Getting Food on the Table – FAST!